Advantages: Great photo coverage across a range of Luftwaffe subjects; helpful captions; well-presented format; 60 large full-colour photographs, emblem and two colour profiles; tie-in with associated decals (available separately). 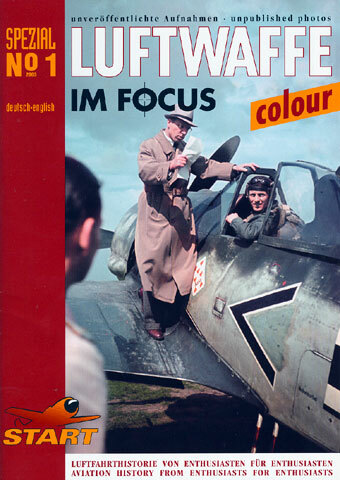 The third edition of Luftwaffe Im Focus continues with this series' excellent photographic coverage of Luftwaffe subjects from the Second World War. In common with the first two release, this book is presented in portrait A4 format, with a soft cover and 40 pages (plus covers). The paper is heavyweight and glossy. The publication is laid out attractively and professionally.. This newest publication, however, is unique in that all 60 photos are in full wartime colour. The colour and quality of the photos is very good indeed, and they are presented large on the page. Many of the subject aircraft have been photographed from different angles - an excellent reference aid to the modeller. Subjects covered in the Colour Special include Bf 109s, Bf 110s, Ju 87, He 111, Ju 188, Fi 156 and some great picstures of a Gotha Go 244 supported by an attractive profile. In addition to the aircraft, there are also colour photos of some well-known Luftwaffe personalities including "Pips" Priller and Professor Kurt Tank. Even Adolf Hitler puts in an appearance. 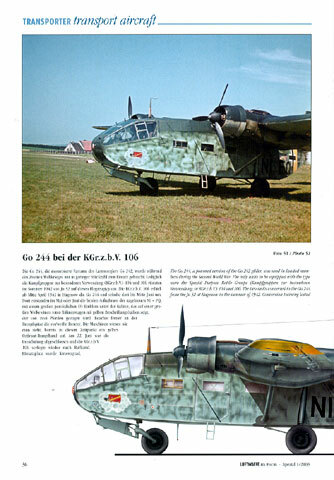 The inclusion of all-colour content is a real treat in Luftwaffe Im Focus Coliur Spezial No.1.